IDMS was established by the ICOMOS (International Council on Monuments and Sites) on 18th April 1982.The theme for the 2018 IDMS is “Heritage for Generations”. On 18 April 1982 on the occasion of a symposium organised by ICOMOS in Tunisia, it was suggested that the IDMS should be celebrated throughout the world. This idea was also approved by the UNESCO General Conference. It passed a resolution at its 22nd session in November 1983 recommending the member states to examine the possibility of declaring 18th April each year as the IDMS. 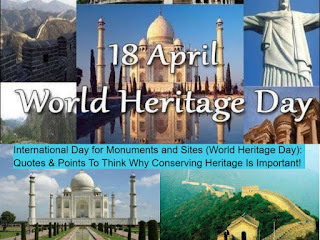 IDMS had been traditionally known as the World Heritage Day. Hanging banners in town squares to spread awareness about the preservation of our cultural heritage. Inviting local and foreign experts for conferences and interviews. Organizing discussions in cultural centres, city halls and other public spaces. Publications of books, post-cards, stamps, posters etc. Inaugurate a recently restored monument. Conducting awareness increasing activities amongst school children and youth. Awarding prizes to organizations or persons who have made an outstanding contribution to the conservation and promotion of cultural heritage.